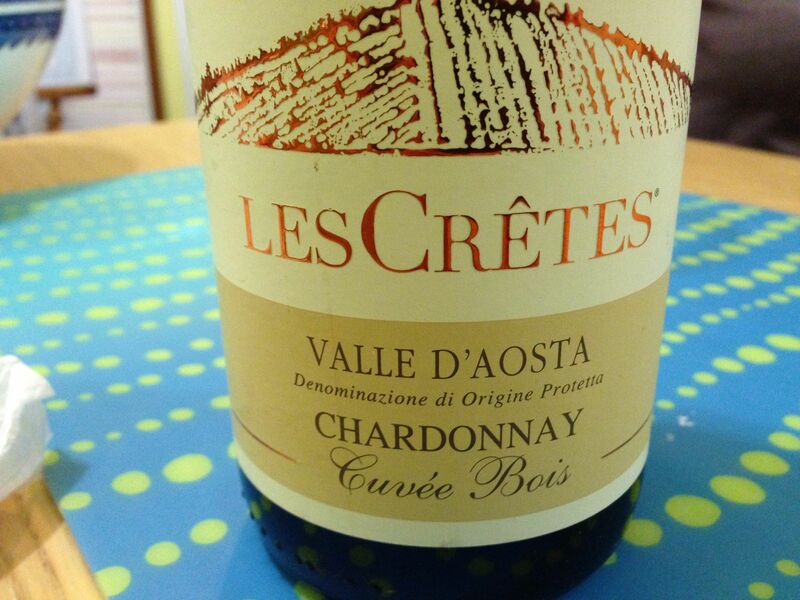 This week’s wine of the week is Les Cretes Chardonnay Cuvée Bois Valle d’Aosta. The wine was exquisite with a beautiful gold color and a rich bouquet of fruits and flowers with considerable sapidity and oak notes. The wine ferments in small French oak barrels before resting on its lees for 10 months with continuous battonage. It then spends 8 months in the bottle before being sold into the market. Not an inexpensive wine, it was very interesting and would pair well with numerous foods from hearty pastas to meat-based dishes and even some aged cheese. It has a hint of late harvest notes with a touch of sweetness that would suggest it could be a good pairing for Foie gras as well. Les Crêtes was founded in 1989 in Aymavilles (Valle d’Aosta) by Costantino Charrère. His family has owned a water mill since the 1700s and has been in agriculture for five generations. The winery owns 25 hectares in the towns of Saint Pierre, Aymavilles, Gressan, Sarre, Aosta and Saint Christophe. The vineyard parcels are very fragmented and densely planted with 8.000-9.000 plants per hectare. The vineyards are very hilly with sandy and moranic (originating from an ancient glacier) soils. The winery makes some 230,000 a year but only 7,000 of this particular cuvee. Les Cretes makes a number of wonderful wines including those made from indigenous grapes such as Petit Rouge, Fumin, Petite Arvine, Gros Rouge, Cornalin, Mayolet, and Prëmetta as well as wines made from Pinot Noir, Chardonnay, and Syrah. I will bring the wine to my New Year’s dinner later this evening and see if it pairs with my Apple Honey bundt cake that looks a bit like a donut because the center collapsed. That said, with all those walnuts, honey and apples it can’t be all bad. It’s odd to celebrate when the world is so chaotic and so much around us is not as it should be but I believe in holidays and celebrating as often as possible. So Happy New Year, Shana Tova to those who celebrate and a great Indian Summer to all.